What is the significance of the “Remember Sammy Jenkins” tattoo? 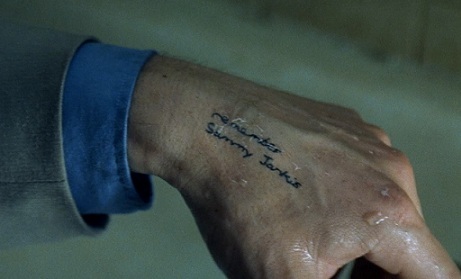 Why did Leonard Shelby have a "Remember Sammy Jenkins" tattoo? Why did he need this tattoo? Leonard has anterograde amnesia, that means he can have his past memories before the accident but not new memories. So what is the significance of having a tattoo of a person's name which he can remember? When he wakes up every morning, he doesn't remember that he has amnesia, and doesn't know that he can't form new memories. The "Remember Sammy Jankis" tattoo is a concise way of telling himself that he has the condition that Sammy Jankis claimed to have. It was a trigger to condition the false memory. It's true he remembered Sammy, but every time he looked at the tattoo, he wasn't remembering the real story. Sammy was actually a fraud, but the story that Leonard's tattoo was conditioning him to believe was that Sammy was telling the truth and that he killed his wife, when in reality that was Leonard's own life story. According to his research while investigating Sammy Jenkins' claim was that amnesia patients should be able to learn new behaviors based upon instinct vs memory; that nesting can be conditioned versus remembered. The electrically charged figure test tried that tendency on Sammy and he failed the test which costed him his claim. Leonard's "remember Sammy Jenkins" tattoo did that for him so he could successfully deceive himself and alter his true past. Not the answer you're looking for? Browse other questions tagged memento . What detail should I be looking for in Leonard in Memento to determine the plot? What really happened in Memento? Why was Teddy using Leonard in Memento? How did Leonard manage to distort his memory of Sammy Jankis? Does Natalie sleep with Leonard in Memento? Does Leonard really have memories before the incident? What is the meaning of the final inner monologue at the end of Memento?